The inner realm of the mind and the external reality of the physical earth are separate places, yet both spheres influence our daily interactions with people and impact our health. Life is in tune when the music from each area strengthens our decisions and enhances our well-being. 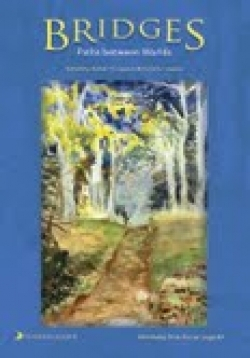 In Bridges: Paths between Worlds, the seventeenth edition of the Swedenborg Foundation’s Chrysalis Reader, fifty-two artistic works—poems, stories, and essays—take the reader on an enlightening journey from one world to the next, demonstrating the significance of the unseen elements of thought, inspiration, and feeling. This year’s Chrysalis Reader includes several notable poets. The prolific Robert Bly, whose poems have been read on National Public Radio, and Linda Pastan, a past poet laureate of Maryland and recipient of the Ruth Lilly Prize, showcase their work, along with Jason Schossler, winner of the Edwin Markham Prize. In addition, two noteworthy essayists appear on the list of contributors: John L. Hitchcock, a Jungian psychotherapist, and Tom Lombardo, a poetry editor and founding editor-in-chief of WebMD. The art of Kate Cheney Chappell, a Maine printer and printmaker, is featured throughout the book. Established by Emanuel Swedenborg in the eighteenth century, the foundation is nondenominational and embraces everyone. Emphasizing free spirituality over conventional religion, this organization bases its beliefs on positive contact between different planes of existence and psychic communication between people. Swedenborg published eighteen theological works and left behind additional unpublished material. This scientist and philosopher is best known for Heaven and Hell (1758). The Chrysalis Reader features a different theme every year, edited by Carol and Robert Lawson. Carol S. Lawson has an extensive background in publishing, having worked for Harper & Row, the American Birding Association, and the U.S. government. Robert F. Lawson is a poet with credits in multiple publications, including Three Rivers Poetry Journal and Kalliope. Within the mysticism of dreams and visions those who seek guidance can find comfort and peace as well as stimulation for creative endeavors. Free from inhibiting tradition and released from the restraint of conformity, life is an opportunity filled with symbolical bridges between worlds.